Color scales are step-by-step mixes showing the range of colors that you get by mixing two colors in different proportions. You can use any two colors to make scales. The first one I did was black to white, then I tried red to yellow, yellow to blue and blue back to yellow to get the colors on the outside of a color wheel. By running the scales from secondary to secondary, or from complement to complement, you can also see the beautiful colors inside the color wheel. There’s no end to the variations possible. Polymer clay is the perfect medium for color scales. It is not messy, it is accurately measurable, you can hold the color in your hand while watching each new color emerge, and the resulting beads or “buttons” can be strung for ready reference. Based on this concept, I developed an easy method of making color scales that I have been using, and teaching, for about 15 years. A few weekends ago, my nephew Joey came down from Seattle to help me make a video on Color Scales. A freshman in college, he’s been making short movies for YouTube for the last few years. We had lots of fun with it and he did a great job with the editing. The video is just under 7 minutes long. Thanks Joey! I wanted to use music from Pink Martini; a local, internationally known band. I asked permission and was referred to Warner/Chappel music. (Yes – the big Warner Co.) Permission is still pending, so Joey cut the music down to the allowable 30 seconds. In the silent parts just imagine piano music. 1. 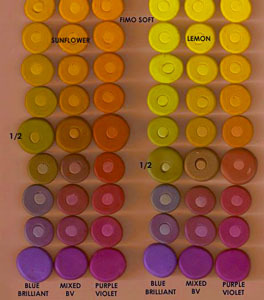 Print out the Color Scales for Polymer Clay handout. 2. Start by mixing a “cool” yellow to a purple clay out of the package as shown in the video. What colors did you get? Did you “hit” a gray along the way? 3. Then try an ultramarine blue to yellow. What colors did you get? Did you “hit” a gray along the way? 4. Mix the blue and purple together and mix that color to yellow. What colors did you get? Did you “hit” a gray along the way? 5. Try the three scales again with a “warm” yellow. The results using Fimo Soft are shown in the photo at the top of the post. Have fun! I’m kinda new to polymer clay and consequently I’m new to Smashing Colour as well. I really do enjoy getting to know colours… but I don’t understand why the geometric scale is better. I can SEE that it looks better, but I don’t understand why. If I wanted to make the same number of mixing on each side for this exercise, would I just waste my clay? Thank you for the tutorial. I learned alot and I will try it. Color scaling is a great way to find new colors that no one else has tried especially if you are selling your work. Thank you for such a great tutorial! This really helps a lot!! If you get a spike in your hits it is because a ClayMate in Brazil shared your wonderful color link with CITY-o-Clay, which has 1,709 list members. LOL We’re loving you tons! Thanks for putting this together. You’re being appreciated around the world now. Great tutorial again, keep it up. If you are interested in tackling the monumental task of color mixing all combinations within a particular brand, I’ve posted checklists on http://www.polymerclayworkshops.com that you can print out and use to create your own color mixes. So far I’ve got Kato Polyclay, Premo and Fimo Classic completed. As always, feedback is welcome. Enjoy! I just love the video! It makes it so much clearer. Thank you for sharing what you learned with us. thank you for this video , it is so clear ! All is well…don’t know what was going on with the computer yesterday! If you had not done the video I would still be wondering how to follow the instructions on the paper I got at Sandy Camp. This seems like enough to keep us busy FOREVER. Is there more? Thank you too for the video and color Scale PDF hand out. It is brilliant idea with video include handout.. Plus Thank you to your nephew Joey with fantastic job and work team with you. Hope there will more videos in your future. Thank you, thank you, thank you (& Joey too) for a wonderfully informative video and a great worksheet too. Now there’s no excuse not to make a bead set. Thank you SO much for this video and color blending recipe lesson! I can’t even begin to express how much this helps me LOL. Every other technique I’ve seen for creating color recipe chips seemed so labor (and math) intensive and I simply don’t have time for all that figuring it out. I have 3 kids and they don’t leave me much time (or many working brain cells LOL). This is SO awesome – I’m going to get started on this today. Thank you for the video! I guess I’m more of a visual learner than I first thought, but watching this video just put it all together for me. Great job!! Hope there are more videos in your future! a few seconds after the video begins…it stops. Are you hearing this from others? or is it just me? The lesson is wonderful, the handout necessary and the You tube video is absolutley awesome! You should just do a full scale DVD of the whole color mixing class. Your directions were concise and exacting, the videography was great and I sure hope you get permission for the music because it really was a great background for the lesson as a whole. Nice job!